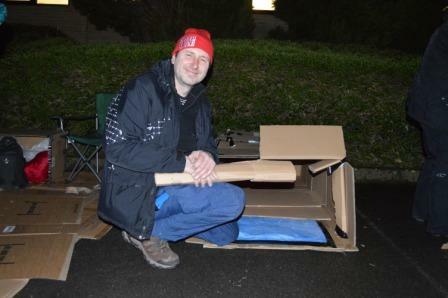 On Friday 8 March, we will hold our annual YMCA Sleep Easy event in Horley to raise the profile of local homelessness by sleeping out under the stars. Although this event doesn’t aim to replicate the hardship of homelessness, joining us to sleep rough for one night and collecting sponsorship from friends and family will raise funds to help young people who find themselves without a secure home to rebuild their lives. YMCA Hillbrook House in Redhill provides safe and affordable accommodation and support for young people in housing need. Our aim is to help young people to live independently. Last year, YMCA East Surrey provided a home to 91 young people facing homelessness and staff continue to deliver over 300 hours of support to residents each month. Dean spent ten months at Hillbrook House after a foster placement broke down. Our staff helped him to enrol into college and signed him up with the Pathway to Employment project – an intensive, targeted and wrap-around service of interventions that support people with significant barriers to move closer to employment. Now living in Supported Lodging, Dean has gained employment in a job he enjoys and feels positive about the future. Money raised from this year’s YMCA East Surrey event will go directly to helping young people at YMCA Hillbrook House to gain vital life skills such as budgeting, personal hygiene, CV writing, interview techniques, cooking and health and wellbeing. Additional funds will be used to help young people into employment by providing interview clothes, travel, money management and support with the all-important interview and subsequent paperwork. By taking part in Sleep Easy 2019 with a group of your friends you could help get a local young person back on their feet and help us to support those who are facing housing crisis. More information can be found at https://www.ymcaeastsurrey.org.uk/get-involved/challenge-events/sleep-easy/ or you can contact our Challenge Events team on 01737 779979 or by email at challenge@ymcaeastsurrey.org.uk. New YMCA Merstham Hub Pre-school is open! YMCA East Surrey is YMCA of the Year!